Detours is a tour company with a difference: You set the agenda and Jonty—as Jayanthi is better known—designs the tour. If you thought the dead tell no tales, sign up for the Necropolis Detour: It traces the history of Hyderabad through the tombs of its emperors, noblemen and saints. Or go for the Weavers’ Detour, into the homes of the artisans who create classic saris such as Pochampalli and Paithani. Jonty’s pride and joy, though, are the culinary tours, which uncover the mysteries of the biryani (but of course) and the chilli, among other kitchen staples. 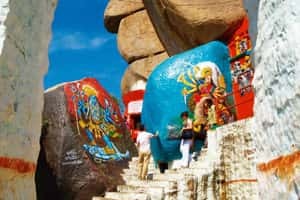 All tours can be customized and suit all budgets, ranging from Rs1,500 per person for a 150-minute Golkonda tour to Rs4,500 per person for a full-day White Mughals excursion. Visit www.detoursindia.com for more details. Road sense: Now brought to book. 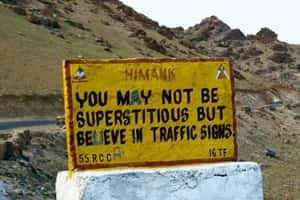 With Peep Peep Don’t Sleep, his compilation of road signs across 10,000km in Ladakh, Himachal Pradesh and Uttarakhand, writer-photographer Ajay Jain saves you the agony of dividing your attention between highway and hysteria while behind the wheel. The photographs actually tell the story; the captions are an unnecessary distraction. Peep Peep Don’t Sleep, a collection of photos by Ajay Jain, is available at bookstores nationwide for Rs350. Tribute: The Flagler Museum is a memorial to American opulence. Chef Daniel Boulud, who operates some of the hottest spots in New York, including Daniel, opened his South Floridian outpost a few years ago in the Brazilian Court hotel, the site of alleged liaisons between Marilyn Monroe and JFK. Scandals aside, Boulud has raised the bar for gourmands on the island. Aperitifs in the hotel’s fabled courtyard are a must. You may pick up some baubles along Worth Avenue, but the island’s alluring history is best gleaned at the Henry Flagler Museum. 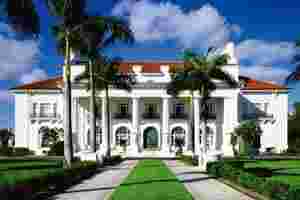 Flagler, the railroad tycoon, turned Palm Beach from a steamy Floridian backwater into the winter retreat of the East Coast establishment. Housed in his 55-room Beaux Arts manse, Whitehall (described as “one of the most sumptuous houses ever built in America"), the museum is a shimmering example of America’s Gilded Age, as Mark Twain dubbed the period between the Civil War and the Wall Street crash of 1929.